We have all seen pieces of plastic and other garbage floating in the water near our boats or washed up on our beaches. There are many regulations that apply to dumping of garbage, sewage, and oil waste. This column addresses a few of those, and discusses the Coast Guard’s participation in pollution prevention. Smokey Bear said it well about forest fires: “Only you can prevent forest fires.” The new motto replaces “forest fires” with “wild fires.” The same line of thought can be applied to water pollution. One part of the pollution prevention program includes reporting pollution. However, it is much more desirable to institute practices that prevent pollution from happening in the first place. The Marine Environmental Protection program develops and enforces regulations to avert the introduction of invasive species into the maritime environment, stop unauthorized ocean dumping, and prevent oil and chemical spills. The Coast Guard has extensive regulatory and enforcement authority to prevent unlawful ocean dumping and oil and hazardous substance pollution. The Coast Guard employs two broad strategies to accomplish the goal of protection of natural resources: prevention and preparedness. The goal of the prevention program is to reduce the amount of oil, chemicals, plastics and garbage going into the water from maritime sources. This goal is accomplished through enforcement of statutory and regulatory requirements for disposal of shipboard waste. Environmental Coordination: coordinating responsibilities and pollution response capabilities from government, private industry, and other organizations. Protection of Sensitive Areas: targeting of environmentally sensitive areas for special protection. Response Resources: identifying necessary pollution response equipment and resource shortfalls. Training & Exercises: monitoring training and exercise schedules and requirements for government and marine industry personnel. Vessel & Facility Response Plans: requiring owners and operators to prepare and maintain pollution response plans ensuring immediate availability of specialized equipment and qualified personnel to cleanup and mitigate the effects of a pollution incident. Certificates of Financial Responsibility (COFR): requiring owners and operators to certify their financial ability to pay for the impacts of oil and hazardous materials discharged or released into the marine environment. 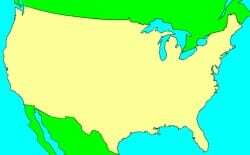 Without a COFR, ships are not allowed to enter United States territorial waters. Preparedness Response Exercise Program (PREP): owners and operators conduct and participate in response exercises to test and improve their preparedness. When environmental harm threatens U.S. waters, the Coast Guard coordinates response efforts using resources of all levels of government and private industry. The Coast Guard requires that industry take primary responsibility to maintain or contract for pollution response equipment for cleanup operations. The Coast Guard has developed regulations regarding waterway pollution that affect recreational boaters. It is not just the large ships that pollute. Some of those regulations concern the display of certain placards such as pollution placards and MARPOL trash placards, which outline the legal requirements regarding pollution. The Refuse Act of 1898 prohibits throwing, discharging, or depositing any refuse matter of any kind (including trash, garbage, oil, or other liquid pollutants) into the waters of the United States. This regulation has been in effect almost 120 years! 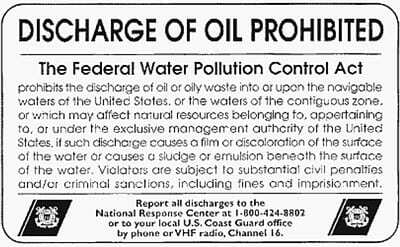 Vessels over 26 feet with a machinery compartment must display an oily waste “pollution” placard, at least 5 x 8 inches, made of durable material, fixed in a conspicuous place in the machinery spaces, or at the bilge pump control station. A fixed or portable means to discharge oily waste to a reception facility is required. A bucket or bailer is suitable as a portable means of discharging oily waste on recreational vessels. Just don’t discharge it into the water. No person may intentionally drain oil or oily waste from any source to the bilge of any vessel. Automatic bilge pumps will discharge whenever activated by water, so make sure your bilge is clean and you have no machinery oil leaks. The Coast Guard must be notified immediately if a vessel discharges oil or hazardous substances into the water. Call the National Response Center at 1-800-424-8802. 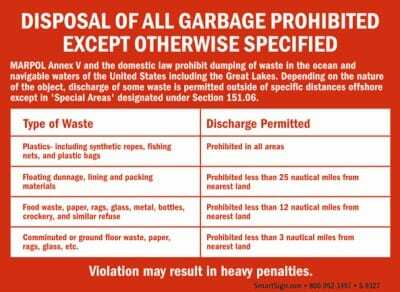 Boats 26 feet and over in length, operating in U.S. navigable waters, must display a “MARPOL” trash placard. It is illegal to dump plastic trash anywhere in the ocean or navigable waters of the United States. It is also illegal to discharge garbage in the navigable waters of the United States, including the Great Lakes. The discharge of other types of garbage is permitted outside of specific distances offshore, based on the nature of that garbage. United States oceangoing vessels 40 feet or longer that are engaged in commerce or are equipped with a galley and berthing must have a written waste management plan describing the procedures for collecting, processing, storing, and discharging garbage and must designate the person in charge of carrying out the plan. Any INSTALLED toilet must be a Coast Guard approved device. Overboard discharge outlets must be capable of being sealed. All recreational vessels with installed toilet facilities must have an operable marine sanitation device (MSD) on board. Vessels 65 feet and under may install a Type I, II, or III MSD. 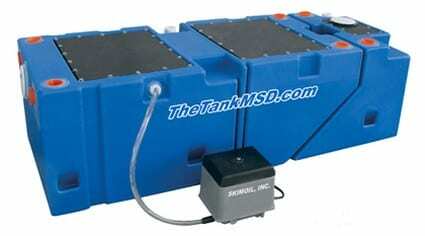 Type I and Type II are flow through devices, while a holding tank is a Type III device. All installed MSDs must be U.S. Coast Guard certified and so labeled, except for some Type III holding tanks which are certified by definition under the regulations. Type III holding tanks are designed for the storage of sewage and flush water and may be of various design including commercially manufactured and home built tanks or other containers. The discharge of treated sewage is allowed within three nautical miles of shore except in designated no discharge zones. Untreated sewage may be discharged beyond that three mile limit. In Texas, no sewage can be discharged within inland waters (lakes and rivers). Although Texas follows the federal regulations on coastal waters sewage disposal, Florida’s no discharge zone extends to nine nautical miles from shore. Be sure to know the regulations of the state within whose limits you are operating your boat. 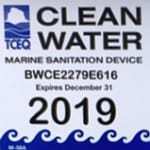 The Texas Commission on Environmental Quality (TCEQ) has an additional requirement that any boat with a permanently installed marine sanitation device (MSD) is required to obtain an MSD certification and display a certification decal if the boat is operated on any waters in Texas, including coastal waters up to three nautical miles from shore. For certification and decal information contact: www.tceq.texas.gov or (512) 239-0400. Anyone witnessing an oil spill, chemical release, or maritime security incident should call the National Response Center (NRC) Hotline at 1-800-424-8802. The NRC is not a response agency. It serves as an emergency call center that fields INITIAL reports for pollution and railroad incidents and forwards that information to appropriate federal and state agencies for response. 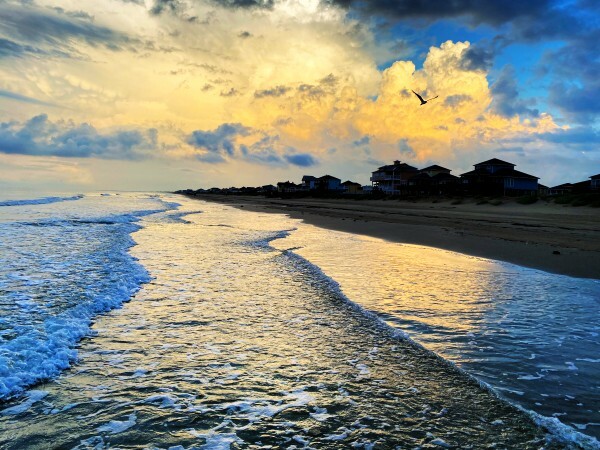 It is everyone’s responsibility to keep our waters clean and safe. Be aware that there are several federal and state regulations we have to follow, and some of those regulations ar based on the length of your boat and your sanitation devices you may have aboard.